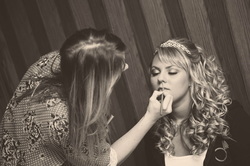 Providing the Quincy, IL area with exceptional skin care treatments, spray tanning, waxing and bridal services! I am a licensed esthetician/make up artist. My goal is to make my clients feel at home all the while feeling relaxed and rejuvenated while giving them professional skincare treatments with top of the line professional skincare products IMAGE Skincare. God made us all uniquely beautiful, in His Image. Today's world can keep us busy with all walks of life. As we age I feel it's nice to find time to pamper ourselves and also find ways to improve our health/skin. Having regular visits in my treatment room (following with a good skin care regimen) will improve your skin dramatically. You will leave here feeling refreshed and rejuvenated. I also specialize in make up artistry. I use an amazing, professional mineral make up line specifically made for acne prone and sensitive skin. It is 100% acne safe, non comedogenic. Its ingredients help to reduce inflammation, and protect the skin barrier. This make up line is gentle enough for even the most sensitive skin type. It wears beautifully ALL day long and feels silky smooth. There is no other mineral makeup on the market today that can compare. It has a wonderful, light feel with a natural, great coverage! No woman likes to apply their make up and feel loaded down with too much make up on. Please check out my menu and schedule an appointment today! 20% off Base Make up - my base make up is a line specifically made for acne prone/ sensitive skin. It’s ingredients help reduce inflammation, and protect skin barrier and also gentle enough for the most sentive skin type! It has a wonderful, light feel with great coverage and wears beautifully all day long! ​Show the Mom in your life just how much you love her with this an relaxation escape. Give Mom or someone who means the world to you the gift of glow this Mother’s Day with my Love Your Mother Spa Package! Her face, eyes, lips, neck, shoulders, arms -even her hard working hands and feet – will get the deluxe treatment she more-than deserves! She will also receive a take home gift bag with this package! I also added a Deluxe Beauty “it’s a Hottie” Package for a more adventurous mama! This Mother’s Day package has a little bit of everything kinda fun in it! Classic Gift Card – pick it up at AgelessbyKarla. ​Want to make an appointment, order gift cards in advance, or have a question? Call me at (217)653-0722 to make Mother’s Day extra special.